DIRECTV NOW Channels List: What Channels Are On DIRECTV NOW? Gone are the days where cable was a necessity in order to watch live TV. There are now several services that allow subscribers to stream live TV without a cable subscription. DIRECTV NOW is one such service. We are often asked about what channels are on DIRECTV NOW, so today, we’re going to take a closer look at the DIRECTV NOW channels list, and give you some more info on the service. If you have any questions regarding what channels are on DIRECTV NOW, how the DIRECTV NOW local channels work, etc. we’ll make sure to cover all the bases and answer your questions. For now, let’s get started with the basics. For those who are unfamiliar with the service, DIRECTV NOW is an online streaming service that lets you watch live TV without a cable subscription. It includes 40-120+ DIRECTV NOW channels, depending on which package you choose. These channels can all be watched live, and select content is also available on-demand. You can use DIRECTV NOW on most devices. Stream on your computer or laptop, your mobile device, or on your TV with the help of a streaming device. You can watch from anywhere with an internet connection or cell signal. DIRECTV NOW starts at $50 per month and does NOT require a contract. That means you’re never locked into anything long-term and can cancel DIRECTV NOW whenever you please. Being able to watch live TV without cable is great – so long as you get the channels you want and are accustomed to! Luckily, DIRECTV NOW offers some excellent channels, ranging from live sports on ESPN to comedies on Comedy Central to home improvement shows on HGTV. You can even add premium channels, like HBO and Cinemax! There are several different DIRECTV NOW packages, so in the section below, we’ll break them down into each individual package, to help you decide which choice is right for you. Update April 2019: DIRECTV NOW has made major changes to their channel lineup. The old plans are still available, but the names have been changed and the prices nearly doubled. There are now two new plans, called “Plus” and “Max”. The updated DIRECTV NOW channel lineup is found below. DIRECTV NOW Channels Included: HBO, local channels, HBO Family, HBO Latino, ABC, Accuweather, Audience, BET, Boomerang, Bravo, Cartoon Network, CBS, Cheddar, CNBC, CNBC World, CNN, Comedy Central, The CW, Disney Channel, Disney Junior, Disney XD, E!, ESPN, ESPN2, FOX, FOX Business, FOX News, FS1, Freeform, FX, FXM, FXX, Hallmark Channel, HLN, MSNBC, MTV, My Network TV, National Geographic, Nat Geo Wild, NBC, NBCSN, Nickelodeon, NickJr, Ovation, Oxygen, Revolt, SyFy, TBS, TCM, Telemundo, TNT, TruTV, Universal Kids, USA, and VH1. DIRECTV NOW Channels Included: HBO, Cinemax, local channels, HBO Family, HBO Latino, ABC, Accuweather, Audience, BET, Boomerang, Bravo, BTN, Cartoon Network, CBS, CBS Sports Network, Cheddar, CMT, CNBC, CNBC World, CNN, Comedy Central, The CW, Disney Channel, Disney Junior, Disney XD, E!, ESPN, ESPN2, ESPNEWS, ESPNU, FOX, FOX Business, FOX News, FS1, FS2, Freeform, FX, FXM, FXX, Golf, Hallmark Channel, HLN, Longhorn Network, MSG, MSG+, MSNBC, MTV, My Network TV, National Geographic, Nat Geo Wild, NBC, NBCSN, Nickelodeon, NickJr, Olympic Channel, Ovation, Oxygen, Paramount Network, Revolt, SEC Network, SyFy, TBS, TCM, Telemundo, TNT, TruTV, TV Land, Universal Kids, USA, VH1 and YES Network. Key Channels: ALL channels included in the Live a Little base package (except Hallmark Movies and Ovation), plus regional sports networks, AWE, BTN, CNBC World, Comedy.TV, Cooking Channel, ESPNEWS, ESPNU, Fuse, Fusion, GSN, IFC, JusticeCentral, MLB Network, NFL Network, Nicktoons, OWN, POP, Science, SEC Network, Sundance TV, Tennis Channel, Travel Channel, TV ONE, UniMas, UP and The Weather Channel. Key Channels: ALL channels from the Live a Little and Just Right package (except Hallmark Movies & Mysteries), plus American Heroes, Aspire, BBC World News, BET HER, CBS Sports Network, Destination America, Discovery Family, Discovery Life, DIY, FM, Fox Sports 2, FXM, FYI, Golf Channel, Lifetime Movie Network, LOGO, MTV Classic, Nat Geo Wild, NBA TV, NHL Network, Olympic Channel, Oxygen, Revolt, Sportsman Channel, TVG, Universal Kids, and NBC Universo. Additionally, DIRECTV NOW is regularly adding new channels. We will keep this guide updated as the DIRECTV NOW channel lineup continues to grow. If the DIRECTV NOW channels list still seems a bit lackluster to you, keep in mind that you can also add premium channels like HBO, Cinemax, Showtime or Starz. These channels add premium content that is not available anywhere else. These channels are included in some of the DIRECTV NOW packages, and they can be added on to the others. HBO costs $15 per month extra, Cinemax costs $11 per month extra, Showtime $11/mo extra, and Starz costs $11 per month extra. 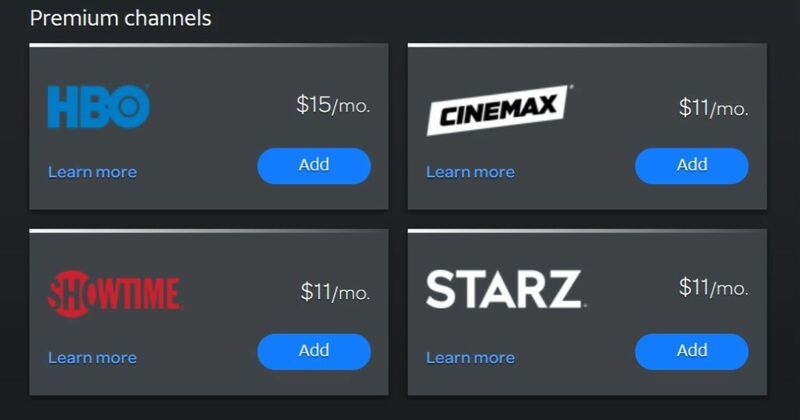 Again, these can be added to any of the DIRECTV NOW packages. These premium channels also offer free 7-day trials, but you must also sign up for a DIRECTV NOW package (you can’t just get HBO, in other words). ABC – ABC streaming is available live in select markets. Currently, DIRECTV NOW covers ABC in 70+ different markets, including all of the top 50 markets by population. NBC – NBC streaming is available live in select markets. Currently, DIRECTV NOW covers NBC in 80+ different markets, including most of the top 50 markets by population. FOX – FOX streaming is available live in select markets. Currently, DIRECTV NOW covers FOX in 100+ different markets, including most of the top 50 markets by population. CBS – CBS streaming is available live in select markets. Currently, DIRECTV NOW covers CBS in 80+ different markets, including most of the top 50 markets by population. The CW – CW streaming is available live in select markets, including Philadelphia, San Francisco-Oakland-San Jose, Atlanta, Seattle-Tacoma, Tampa-St. Petersburg, Detroit, Sacramento-Stockton-Modesto, and Pittsburgh. Telemundo – Telemundo streaming is available live in select markets, including Boston, Chicago, Dallas-FT Worth, Denver, Fresno-Visalia, Houston, Los Vegas, Los Angeles, Miami-Ft Lauderdale, New York, Philadelphia, and Phoenix. MyTV – My TV streaming is available live in select markets, including New York, Los Angeles, Chicago, Dallas-Ft. Worth, Washington, DC., Houston, Boston, Phoenix, Minneapolis-St. Paul, Miami-Ft. Lauderdale, Orlando-Daytona Beach-Melbourne, and Charlotte. If you see your local area listed here, you should be able to get the relevant local channel to stream live via DIRECTV NOW. If you don’t live in a covered area, you won’t get that DIRECTV NOW local channel, unfortunately. For some networks, you may be able to use your DIRECTV NOW login to authenticate a TV Everywhere app, such as FOX Sports GO. This will allow you to watch select content from that channel, even if you don’t live in an area where that channel is offered. Additionally, in some areas on-demand content may be available from these networks, even if the live stream is not available. Fox Sports Regional Networks – DIRECTV NOW offers all of the FOX Sports Regional networks that are available throughout the United States. This will be very useful for following your local MLB, NBA, and NHL teams, as well as some college sports, nationally televised events, and more. Keep in mind that you’ll only get the network(s) that are normally broadcast in your area, and availability may vary. Comcast Sportsnet Regional Networks – DIRECTV NOW offers most of the Comcast SportsNet (CSN) networks that are available throughout the United States. These channels are a must for keeping tabs on your local teams and events. You’ll only get the network(s) that are normally available in your area, and again, availability may vary. To get a definite answer of what regional sports networks you can enjoy on DIRECTV NOW, refer to this list. Hint: to save yourself the trouble of combing through this 132-page document, hit “CTRL + F” (hold down CTRL and press F at the same time) to bring up a search bar. Then, plug in your ZIP code to find what’s available in your area. Keep in mind that, while DIRECTV NOW offers a lot of regional sports networks, you aren’t guaranteed to get one as they are not available everywhere. Additionally, sometimes local/regional blackouts of certain events apply on these channels. 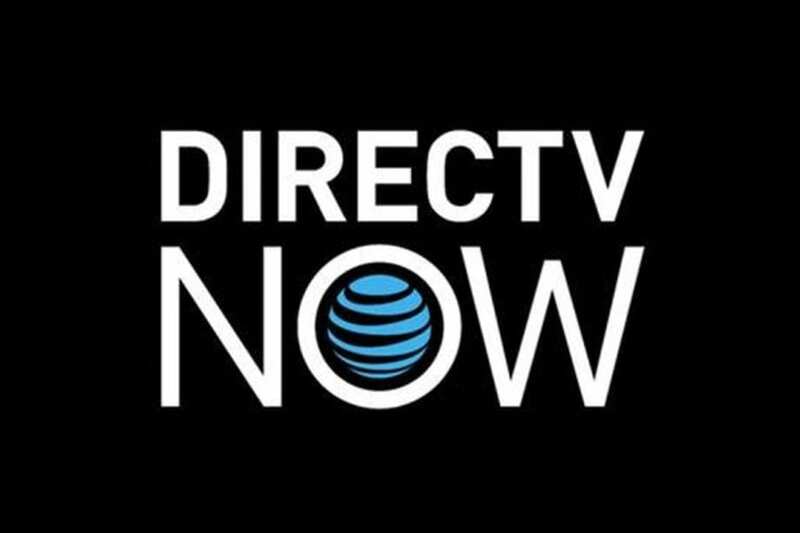 Lastly, know that your location used to determine what channel(s) are offered to you is based on your billing address on file with DIRECTV NOW. DIRECTV NOW offers a couple different options for Spanish speakers. One is to add on a specific channel package to an existing base package. This will run $15/month for the base Spanish pack, or $5/month for a Spanish language sports expansion. These add-ons give a handful of Spanish language channels for an affordable price, and can be added on to any of the standard DIRECTV NOW packages. This package offers 90+ channels, including over 30 Spanish-language channels, plus many English channels from DIRECTV NOW’s other packages. The Optimo Más package costs $86 per month, with no contract. How Does the DIRECTV NOW Channels List Compare? 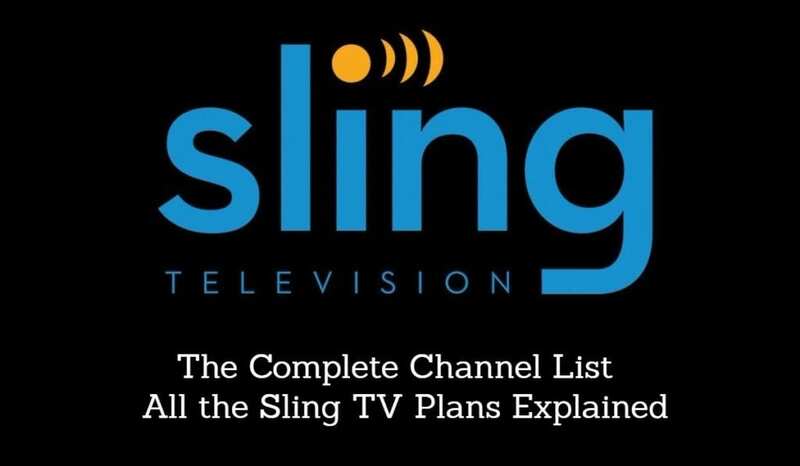 With up to 125+ channels, there’s a ton of selection and a lot of really good channels. BUT, if you want that many channels, you’re going to pay a huge monthly rate of $100+ a month. Compared to the competition, DIRECTV NOW is simply too expensive any more. The base packages (Plus and Max) offer a decent value, particularly for folks who want HBO. Since HBO is $15 on its own, paying $50 for 40+ channels + HBO is not a bad deal. But the other 4 packages are very expensive. Compared to cable TV, DIRECTV NOW is still probably a better deal. The DIRECTV NOW channel packages are actually fairly comparable to what is offered by cable and satellite subscribers, with two key differences: price, and commitment. DIRECTV NOW is cheaper than most traditional services and does not require a contract. Additionally, there’s no fancy low introductory pricing to rope you in and no future price hikes, as DIRECTV NOW pricing is set. Want to learn more? Check out our DIRECTV NOW review, or try the service out for yourself with a full week-long free trial! Where is CBS? I don’t think I have seen anything about CBS. Was the GOLF channel included anywhere? Go package has the Golf channel. No CBS here, but I think I saw it on PSVue with the Golf channel. No one has PBS! That’s the real deal breaker now. You can buy a HDTV Antenna to connect to your tv and get most of your local channels and more – at BestBuy for $25! And it’s a little bigger, but thinner than a mousepad and can be mounted on your wall…and you can paint it the color of your wall too! Works great! Hallmark Mysteries and Movies is only on the lowest tier. It’s the only channel that goes away when you pay more. Who does that? I am planning to cut the cord soon, but that is a non starter for my wife. Sling TV here we come. Have you reached out to them about this? That sounds very strange. Wonder if it’s a bug or something? Can you record shows with direct tvnow? It states that direct TVs Now packages will not go up in price. How can this be.? Then why does regular DirectV price go up so often? We just had another price hike. Is Direct TV NOW available in my area? I live in Hayden Idaho, zip is 83835. What will the cost be? Can I get the western channel?